Today marks 13 years of marriage for us (and I would post a photo of us on our wedding day, but I think I might fall out of Mr. FG’s favor if I did that!). And since our anniversary happens to fall on a day where things are usually quiet around here, I thought I’d take the liberty of blogging about it. Something that I really appreciate about our relationship is that in all the important stuff, we’re heading down the same path…we both love God first, we both want to serve in the church, we both want to reach out to the people around us, we both want to raise children who love God, we both want to grow in holiness and put sin to death in our lives, we both want to honor God with our money, and because we share core ideas like that, our lives together aren’t wrought with conflict. Having the same foundational beliefs makes it much more likely that the things we want to build on that foundation are the same, and I’m so grateful for that. On the other hand, Mr. FG and I are not at all carbon copies of each other. In fact, we’re pretty different in a lot of ways, and I think that’s good for both of us. We’re complementary, not copies. He’s the spontaneous to my I-must-always-plan-things. He’s the generous to my I-need-to-keep-my-money. He’s responsible with big purchases; I’m responsible with small ones. He talks to one person at a party and I talk to everyone. He takes pictures of landscapes, and I can hardly take a picture without a person in it. He’s the techie expert to my “please fix my computer!” (though I can run circles around him when it comes to blogging techie stuff!). He’s the realism to my optimism. He’s the “Let’s go have some fun!” to my “But I have work I need to do!”. He’s the one who watches sports with Joshua (yay that I don’t have to!) and I’m the one who does the crafty/baking stuff with our kids. He’s the order-the-same-thing-every-time to my try-something-new-every-time. He’s the take-time-for-people to my work, work, work. He’s even the order-a-burger-with-almost-nothing-on-it to my order-a-burger-with-almost-everything-on-it. And he’s the one who buys me thoughtful gifts, sends me morning emails that make me smile, gives me more compliments than I deserve, thinks I’m beautiful when no one else would, laughs at my jokes, fills my incessant need for hugs, notices when I wear something new, and makes me feel loved and adored. He’s my best friend, and I’m so glad I’m his girl. « Grocery Spending/Menu Plan | 4 weeks ’til vacation! Congratulations! May God bless you both as you journey together! What a sweet post….Happy Anniversary. Ours is tomorrow…and I almost forgot, until I read this! Twenty-four years! Happy Anniversary! BTW i love Five Guys! So awesome! 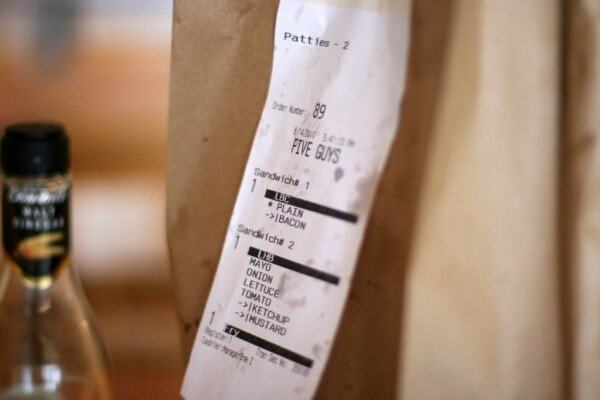 Also…….Five Guys is SO GOOD!!! Aw, this was absolutely beautiful. Congratulations on your 13 years together! Happy Anniversary! What a sweet post! Our 7th is on Tuesday. I found your blog about a month ago, and, since then, I’ve been following it daily. While our specifics are different (I work full time, have one child so far, and am Jewish), many of our values are the same. Thank you for writing this blog. I certainly get a lot out of it! 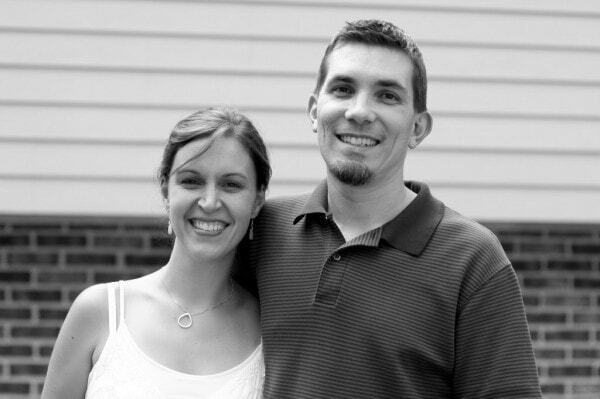 There IS a single wedding photo on an old post somewhere here on this blog (a profile shot of both of us) and you might be able to find it using the search feature. I haven’t tried myself! I am so happy for you both. What a sweet post. It is so very touching, encouraging and just plain gives me a case of the “warm fuzzies!” And I am really needing that today. Isn’t God wonderful to give us just what we need, when we need it? My husband and I have 20 years in and have done it sorta backwards…but we are growing in God’s grace and we are headed in the right direction. Thank you for opening your lives and inspiring many people to be the people that God wants us to be! May God continue to richly bless the work of your hands. Happy Anniversary!! I hope you get many more, and still helping us when we get 100 hundred years old!! That was a very sweet blog about your anniversary. I loved that pic and you guys look so much in love. A very happy couple. Congratulations!!! Congrats. WE also celebrated our 13th and have 4 kiddos. I enjoy reading your blog and ideas. Especially your pictures. I have similar values and ideas but I dont take a picture of it and blog it. Thanks for your posts, You inspire me! Congratulations! I cracked up when I saw your photographic evidence of different hamburger preferences – thanks for sharing! SO sweet! I love hearing your feelings about your husband. Congratulations! Congrats! I got married yesterday! (I’m supposed to be online paying bills, not reading blogs). I’m also the one who gets a burger with almost nothing on it! My eyes are misty…such a beautiful post! What a nice way to honor your love for each other. Congratulation, Mr and Mrs Frugal Girl! Happy anniversary….. I hope you guys had a great weekend! Congratulations! We recently celebrated my husband’s grandparents’ 70th wedding anniversary with them — what a testimony to God’s faithfulness! May God bless you with many more happy years together. Happy Anniversary! Wow! Thirteen is a lucky number for you this year! Differences can be good. Sometimes what drives us insane one moment is exactly what we need the next! so cute! thanks for the inspiration and love you shared! You know the funny thing I start to notice about you and your hubby (this even includes me and my honey), you both are starting to look alike. I find that so funny. I think it’s because you both start to make the same gestures or smile. My husband and I just celebrated our anniversary on August 11th! Have you mentioned how your husband and you met? If not, would you share in a future post? Thanks. Congratulations to Mr. and Mrs. Frugal Girl! Best wishes for many many many more happy years.